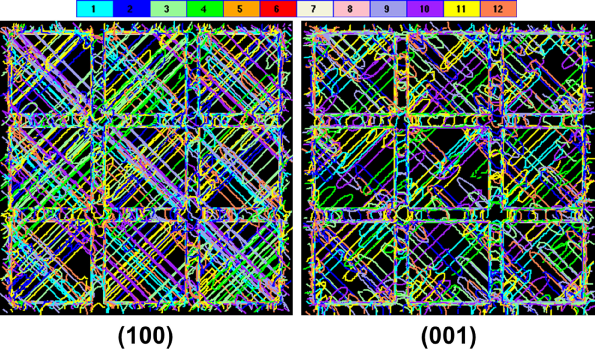 Dislocation configurations in matrix channels obtained for a simulation with a negative lattice mismatch ratio of δ=−0.005. Dislocations are viewed in projections on (100) and (001) crystallographic planes, as given in the figures, after simulation times of 15 ns. Graphic reprinted from Journal of the Mechanics and Physics of Solids, 76, 276-290, © 2015 with permission from Elsevier. In the characteristic γ/γ′ microstructure of single crystal superalloys, misfit stresses occur due to a significant lattice mismatch of those two phases. The magnitude of this lattice mismatch depends on the chemical composition of both phases as well as on temperature. Furthermore, the lattice mismatch of γ and γ′ phases can be either positive or negative in sign. The internal stresses caused by such lattice mismatch play a decisive role for the micromechanical processes that lead to the observed macroscopic athermal deformation behavior of these high-temperature alloys. Three-dimensional discrete dislocation dynamics (DDD) simulations are applied to investigate dislocation glide in γ matrix channels and shearing of γ′ precipitates by superdislocations under externally applied uniaxial stresses, by fully taking into account internal misfit stresses. Misfit stress fields are calculated by the fast Fourier transformation (FFT) method and hybridized with DDD simulations. For external loading along the crystallographic  direction of the single crystal, it was found that the different internal stress states for negative and positive lattice mismatch result in non-uniform dislocation movement and different dislocation patterns in horizontal and vertical γ matrix channels. Furthermore, positive lattice mismatch produces a lower deformation rate than negative lattice mismatch under the same tensile loading, but for an increasing magnitude of lattice mismatch, the deformation resistance always diminishes. Hence, the best deformation performance is expected to result from alloys with either small positive, or even better, vanishing lattice mismatch between γ and γ′ phase.